Coming from Winona, Kansas in 1905, Charles E. Koons started Koons Funeral Home in Sharon Springs in 1911. He received his education at the Williams Institute of Mortuary Science in Kansas City. R.W. “Bud” Koons, the son of Charlie and Ora Koons, returned to Sharon Springs after serving in the Marines during World War II and, continuing his education at Williams Institute of Mortuary Science. Bud and his wife Evelyn (Huffman), also a Sharon Springs native, joined Charlie in the funeral business. After Bud and Evelyn’s son Larry returned from his service in the Navy in 1970, he continued his education at Fort Hays State University and at Central State University—Department of Funeral Science Education. 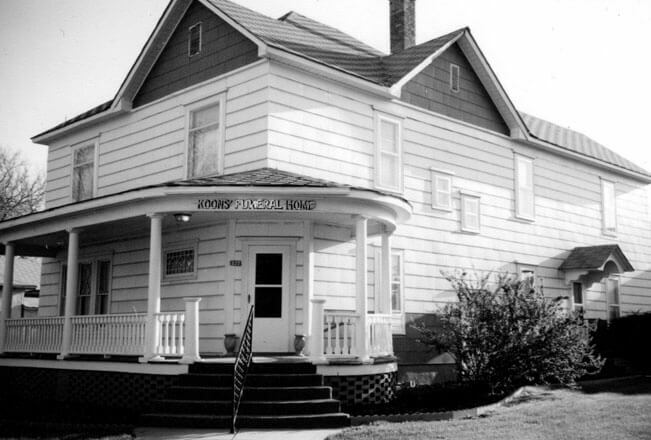 After earning his licenses as a funeral director and embalmer, Larry and his wife Linda (Goudy) opened Koons Funeral Home in Goodland in 1974, as well as working with Bud and Evelyn in Koons Funeral Home in Sharon Springs. The deaths of Charles E. Koons (12-17-1955), R.W. “Bud” Koons (7-11-1994), Larry E. Koons (8-8-1995), and Evelyn I. Koons (10-31-1998) left Larry’s wife Linda Koons as licensed funeral director and owner of Koons Funeral Home in Sharon Springs and Goodland. With the help of a fully licensed staff, she continued to serve the families of northwest Kansas. On October 4, 2016, Linda sold the funeral home to Bryan C. Russell, a Goodland native. Bryan grew up in Goodland, and graduated from Goodland High School. Bryan started in the funeral business in 1998, helping Linda with various jobs around the funeral home while he was still in high school. After graduating from high school, he went on to Mortuary School in Kansas City, Kansas and obtained his degree in Mortuary Science, becoming a Licensed Funeral Director and Embalmer. Following graduation from Mortuary School, he was employed at Love Funeral Home in Burlington and Cheyenne Wells, Colorado, where he eventually became the manager for those two locations until purchasing Koons Funeral Home in October 2016. With this change of ownership, the staff at Koons-Russell Funeral Home continues to offer the same compassionate service to the families of Northwest Kansas that began with the Koons Family in 1911.